A web log by the award-winning Michigan songwriter and solo artist about his passion for writing songs and recording music. Soundtrack Blues: Careful about quality translates to "excellent musicianship," "high production values"
Ever listened to the actual songs that are used in movies or tv shows? I'm not talking about the background music necessarily, and definitely not the instrumental-only stuff or sound effects that fill out the soundtrack. I mean full 4 minute songs, or parts of them anyway. Like the Scorcese movies that always have a memorably-placed Stones song during a scene with no dialog, or the two songs that play at the end of the movie when you look to see the actors names and wonder if there will be bloopers or not. A lot of states, like Michigan, offer discounts or subsidized costs to people who make movies, for example, in order to get them to shoot their movies here. Instead of incentives to hire Michigan people though, they usually bring their own crews from California according to things I've read. It would be awesome if the Michigan Film Office would offer credits for them using original songs from Michigan-based songwriters, recorded by Michigan-based recording artists like me. I'm both. So the reason they'd pick me over Jack White would be that my self-penned and self-recorded songs would theoretically have a much more modest cost associated with them. Movies made in Michigan don't even bother to get famous Michiganders like Jack though, let alone non-famous amateurs like me. A big difference is my overall sound quality, or lack thereof. Even if I got submitted to the supervisor/decision makers for movie music, I'm guessing they wouldn't want the amateurish sound along with the unknown artist factor in their movie they're taking a big risk with. The common thing you may not have noticed with those songs is they are always either ultra-popular songs you'v e heard before, or new songs by ultra-popular artists, or if neither of those, they are very professional sounding and perfectly recorded with outstanding sound quality. Whether the song itself is any good or not does not seem to matter, nor does having the "living room jam" feel and the realness of acoustic instruments played by amateurs. To me, that's a cool vibe that is missing from most films or tv shows. If I were a director, I'd seriously consider recordings like mine, because it would be refreshingly different than what seems to be normal. If your movie is about a chef you can check databases for songs about food so it will fit. You can hire services that offer such databases of songs. Such services reach out to songwriters to stock those databases. The one thing they all want above all else, however, is that polished perfection of delivery - including the instrumental and vocal tracks. Gotta be slick and as commercial as possible. Have you heard much amateurish acoustic music in the background or as credits roll when you watch movies and shows? What about imperfect garage rock played on acoustic instruments? How about tunes by non-famous, non-performing artists? How about bedroom-recorded DIY indie songs by songwriters who have no business singing or even playing instruments for that matter? There are these companies out there like Audiosocket or TAXI who say they have connections in the film and television industries, presumably in California, to connect songwriter's demos of new songs to music supervisors willing to pay for reasonably priced music to be used in the background of movies and shows. The only "catch" is my style of recorded music would never have a chance, so knowing this I don't waste my time on their "feedback" from the "pros" on their staff. I already know what they'd say: "Thanks for the money to join, but your recordings are not professional enough for us to submit to our contacts. Pay for real studio time, pro vocalists and musicians, and try harder!" These services also say things along the lines of "We have to be consistently professional, so even if your songs have great originality, they must be as perfect-sounding as possible." So, the translation here is: "you need to go out and shell out a ton of money on real studio time, get real musicians, or better yet, fake programmed music, and American Idol finalist-quality singers for your songs, then when you're done, submit what you've got and oh yeah, the songs must sound like the mainstream major label pop of current radio play." Stifling to creativity or not, I wouldn't want to even try for that type of thing, even if I had the budget! Why? I write for me. Not for other artists, not in the style of other artists, not to fit a movie or tv show, not to sound all expensively perfect from the best software and microphones money can buy. I write to please myself. As stated previously in past posts in this blog, I have my own weeding out process, and when songs I write fire on more cylinders than others, check more of my own boxes of what I like than others, that's when I record them. And when I record them, I do my best with what I've got and that has to be good enough. If you've read this blog or elsewhere in the website scottcooley.com, you know I'm no stranger to self-deprecation. You've read the preemptive disclaimers: no natural talent, no formal training whatsoever, amateurish sound quality, amateur playing. Terrible singing voice; bad guitar player, weak at all other instruments played as well: drums, percussion, bass, marimba, harmonica, piano, etc. ; poor usage of effects like reverb, bad mixing, bad mastering, etc., ...the list goes on and on. A total amateur who has no business in the music business, yet he keeps on with the fake it 'till you make it thing anyway, ad infinitum! It's not what we're looking for at this time means it's not electronic, ultra-slick, professionally produced, manufactured with perfect drum loops and virtual instruments, auto-tuned vocals, and fitting in with the polished pop mainstream of the day like Ed Sheeran or whomever that equivalent flavor-of-the-moment person is by the time you're reading this post, and we don't care if there's a good melody or lyrics if it's delivered in the typical all-acoustic Scott Cooley rough home demo style. No master use or synchronization license for you. Sorry, good luck, etc. So, I hear what they're not saying. I can read between the lines, just as they can't see the forest for the trees. I'm cool with that. I'll do me, they'll do them, and our paths won't ever cross, since my style of mistake-laden unplugged garage rock with bad vocals is in no danger of becoming en vogue anytime soon. Like it or not, warts and all, I'll keeping doing my thing. "An acquired taste few have discovered" is how my music has always been, its current state, its foreseeable destiny, and I have no allusions of grandeur beyond that. Well, here it is mid-May and we're well past spring training and into the second full month of the 6-month regular season. On June 21st of this year, after the draft but before the all star game in July, you can expect another full-length album of new music from me, I'm proud to announce once again (for the 8th time). Baseball doesn't have coaches, they have managers. It's maybe the equivalent of being a producer of a record. When you're not a major leaguer (or major labeler) like me, you produce your own. In the great American sport of baseball, one of the most important things the manager does is choose the lineup. Also called the batting order, there are some important positions with interesting informal names like leadoff, contact, three hole, cleanup, heart, bottom and last. 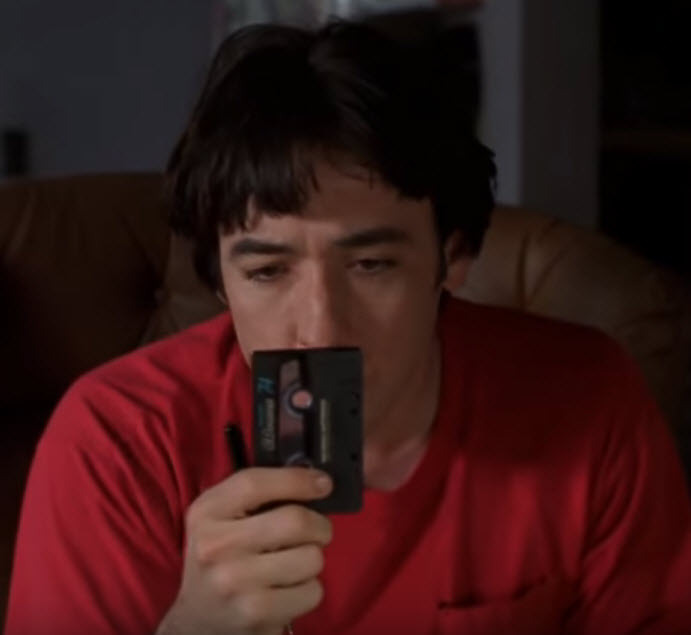 According to the great American movie High Fidelity, the subtle art of making a great compilation tape is a delicate thing: You gotta kick off with a killer, to grab attention, then you've got to take it up a notch, but you don't wanna blow your wad, so then you've got to cool it off a notch. 1. Leadoff: get on base, get off to a good start, grab the fans attention, a killer, 4th best? 2. Contact: keep momentum, take it up a notch (faster, louder), hold attention, 3rd best? Most albums have more than 9 songs, but you get the idea. · Length: You never want two really long songs back-to-back. · Tempo: You never want two really slow songs back-to-back, unless the second one is much shorter (see #8 above). · Tempo+Length: You generally want to insert shorter, faster songs right after slower, longer ones. · Key: You never want two or more songs in a row that are in the same key, if possible to avoid. · Genre: You never want to put stylistically similar songs together in the rotation, if you can help it. · Instrumentation: When you only have two songs featuring an atypical instrument, separate those as well. This is not to say that you can't know the rules, intentionally break them, and still be successful. I've heard it said that fans of the band AC/DC enjoyed the fact that their songs reflected a signature sound, and that their albums delivered that consistently. In other words, they liked the fact that the songs all kind of sounded the same. That said, they added a little variety here and there, for example, by unexpectedly adding bagpipes to their otherwise heavy metal sound. So, when you've got an album's worth of new material recorded and available for release, you're about to play ball. Before you can, however, you get to put on the manager's cap and think of who you want where in the order to give your team its best chance to score and win the game. Just like the all-American pastime, the record business is about the same thing: getting hits. It's fun because you get to be creative with it, figure out how to strategically keep the listener from hitting the fast forward or skip to next track button. The order is always important, despite what recording artists may say to the contrary, and always carefully chosen. My records are no different. 13 new songs in the best order I could muster up. Probably too much thought goes into it, but thanks to the power of electronic word processing documents and tools, the cutting/pasting and rearranging is quick and fairly painless. This next one is no different. Hope you enjoy the songs, and the track sequence!!! As a reminder, my "opening day" is June 21st. Copyright 2005-2022 by Scott R. Cooley. All Rights Reserved. Powered by Blogger.